On 6 February, the International Budget Partnership and the United Kingdom Department for International Development (DFID) co-hosted an event in London, U.K. to address the decline in global budget transparency. Government officials, policymakers, and civil society representatives discussed the findings from the Open Budget Survey 2017 and Harriet Baldwin, joint minister of state for DFID and the Foreign & Commonwealth Office, launched DFID’s new transparency agenda, “Open Aid, Open Societies: A Vision for a Transparent World.” In an article for Devex, the media platform for the global development community, Molly Anders provides a summary of the event and talks to IBP’s Vivek Ramkumar about the survey findings and the role donors play in incentivizing budget transparency. Read the full article here, or watch a recording of the event on YouTube here, or below. The Global Initiative for Fiscal Transparency (GIFT) examines what the 2017 Open Budget Survey results mean for public participation in the budget process. 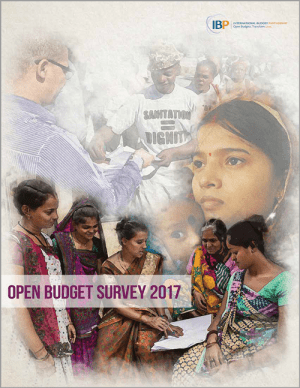 In the article, GIFT lead technical adviser Murray Petrie says that while a small number of countries are engaging the public across the whole budget cycle and exhibit many good practices, the Open Budget Survey 2017 participation results make it clear that all countries included in the survey need to enhance the inclusiveness, openness, and depth of existing public engagement mechanisms and implement similar mechanisms in other stages of the budget cycle. Read more at GIFT’s blog. IBP head of research Jason Lakin has a post on the International Monetary Fund’s Public Financial Management Blog that summarizes the key findings of the Open Budget Survey 2017, and data visualization enthusiasts should check out IBP’s post on the Open Knowledge International Blog. Finally, we recommend reading (or re-reading) Paolo DeRenzio’s Open Budgets Blog post outlining four things governments can do to improve budget transparency and our “Road to Budget Transparency” case studies that aim to identify the catalytic factors that may have prompted governments to take steps to improve budget transparency and some of the specific steps they took to do so.